Plant collections are the backbone of an arboretum. Often like-plants are grown for research purposes, such as to determine hardiness, for representation of different species within a genus, or to test for disease and insect resistance. Collections may be grown to show differences in flowers or fruit, leaves, or size within the same family of plants. 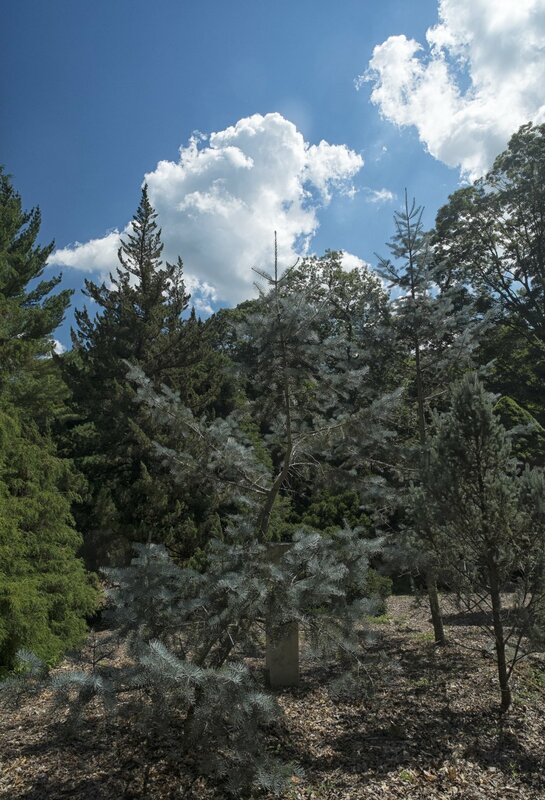 The collections at the Bartlett Arboretum were planted 50 to 100 years ago by Dr. Bartlett and subsequent professors and students from the University of Connecticut when it acquired the property. Read below for information about some of our collections. The original 250 plants comprising 150 species of dwarf conifers have culled themselves over the years, but the aesthetic intent is unsurpassed even with the reduced number of plants. The architect used a synoptic arrangement, grouping plants of each genus together. The other striking point to note is that dwarfs do not stay small; while they grow very slowly, some as little as an inch in a year, the garden’s plants are hardly small in stature some 50 years after they were first planted. Recently, the addition of two contiguous acres will allow for a rebirth of the dwarfs as plans are underway to develop the new property. The juxtaposition of the fully grown dwarf conifers with the newly planted ones will create a remarkable contrast. It is hoped that it will become a reference garden for dwarf conifer connoisseurs the world over. In 1966, the so-called Ericaceous Area no. 1 was established by Dr. Gustav Mehlquist, a noted plant breeder at the University of Connecticut. He developed a rough map for the records of several hundred plants in 15 sections defined by a system of paths. Since this inauspicious beginning, several employees and volunteers have taken on the task to map and remap the Garden, which was dedicated to Dr. Mehlquist years later. He is credited with developing hardy high quality rhododendrons and azaleas, but the garden is also home to Highbush Blueberries, Japanese Andromeda, Enkianthus, and Mountain Laurel, the Connecticut state flower, under the canopy of several hardwood trees. Filled with more than 100 local species on about one quarter of an acre, this garden represents the diversity of attractive native plants that can be used for the home landscape. 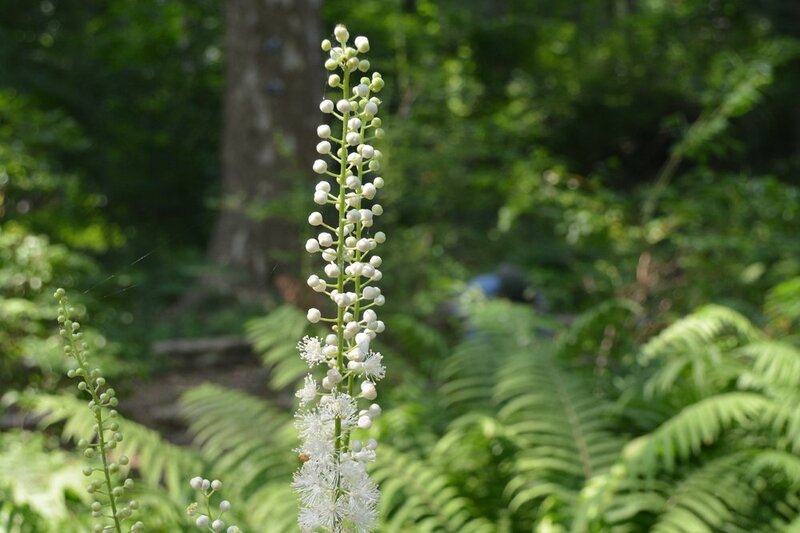 The Woodland Treasures area emphasizes that native plants are important to the local ecosystem because they provide sustenance and habitat for native insects, bees, butterflies, birds, and animals. Some of the noted plants in this garden are Virginia Bluebells (Mertensia virginica), Trout Lilies (Erythronium americanum), Mayapples (Podophyllum peltatum), Black Cohosh (Actaea racemosa), and Jack-in-the-Pulpit (Arisaema triphyllum). The Bartlett family has continued their interest in the Arboretum and their contributions to the collections established by F. A. Bartlett more than 100 years ago. One of the early plantings was Southern Magnolia (M. grandiflora), which Bartlett planted on the side of the Homestead. It had giant white flowers and evergreen leaves. It suffered damage, probably due to marginal hardiness, and was removed in 1979. Robert Bartlett Jr. has a keen interest in magnolias and has provided the Arboretum with several new hybrids in recent years. The collection has grown to more than 40 cultivars of magnificent Star Magnolias (M. stellata), Chinese Magnolias (M. sinensis), and Saucer Magnolias (M. x soulangeana). Three perennial gardens are featured at the Arboretum. The Border, which began in the 1970s as an iris display garden by the Iris Society in Stamford is 140 feet long and approximately 14 feet wide. In the early 1980s, it started to evolve under the directorship of Ted Lockwood (who served in the position from 1979 to 1987) as tired bulbs were replaced with colorful perennials. Today, it’s packed with more than 100 varieties of plants, paying close attention to natives and a shady/sunny mix depending on where they are situated in the garden. The garden attracts pollinators and is a source of nourishment or host for their eggs. It is designated as a Monarch Waystation. The border takes care of itself with only a weekly weeding and infrequent watering. High maintenance plants are avoided. Meticulous attention is paid to the arrangement of color and texture, so that every season offers a different visual tapestry. This garden hosts a sundial and one of the best vistas of the Arboretum. It has full sun exposure, so all the plants in the garden can be considered drought tolerant and fairly deer resistant. Many of the plants have been chosen for attracting birds, butterflies, and bees in the area. Named for the popular British gardens in the 18th century, ours sat behind a cottage built in 1934, which was destroyed during hurricane Sandy in 2014. The garden plants enjoy both sun and shade, beginning in spring with the hellebores (Helleborus spp.) and finishing the growing season with a display of Japanese Toad Lilies (Tricyrtis hirta) and chrysanthemums. Dr. Bartlett was especially enamored of nut trees and several of his plantings remain to this day. Pecans, Walnuts, Butternuts, the Heartnut, and Horsechestnuts are scattered about the property. A witches’- broom is a characteristic of some coniferous evergreens. It is an abnormal growth of dense, darker green foliage near the inner truncated branches that mound into a form similar to representations of witches’ brooms. They can be caused by a natural mutation or by a parasite or virus that causes the natural growth to mutate. Dr. Sidney Waxman, a noted University of Connecticut horticulturist who studied this, developed several varieties from seedlings and donated 12 of them in the early 1980s, adding to a small collection already at the Arboretum. His donated brooms were all mutants of White Pine (Pinus strobus). A large grouping of needled evergreens, including pines, spruces, true cedars, false cypress, and hemlocks is clustered near the edge of the cultivated grounds, and is known as the Pinetum. Among the more magnificent specimens originally found there is the Cedar of Lebanon (Cedrus libani), a grand tree with broad branching and a thick trunk. 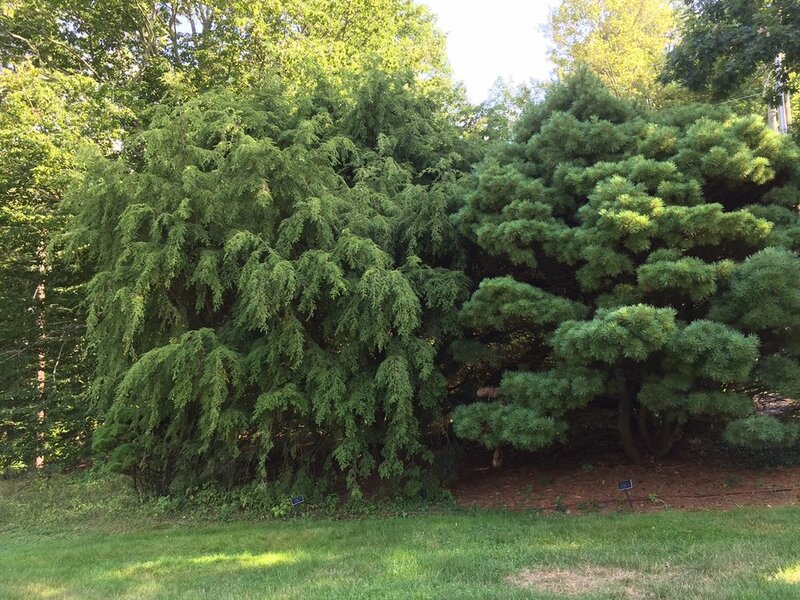 In recent years, it has been damaged by storms and is overshadowed by the Japanese Umbrella Pines (Sciadopitys verticillata)(left) with needles that diverge around the stem giving it an “umbrella” effect and Weeping Hemlock (Tsuga canadensis ‘Pendula’)(right), which is a splendid example of a graceful pendulous conifer. Laurel Collection. Connecticut’s state flower, Mountain Laurel (Kalmia latifolia), is well represented at the Arboretum with as many as 150 different forms of the plant on the grounds dating back to 1971. Two other natives thrive as well: Sheep Laurel (K. angustifolia) and Eastern Bog Laurel (K. polifolia). They can be found in the Conifer Garden and around the main house. Native laurels have white to pink flowers, and broadleaf evergreen leaves. Mountain Laurel can get very large when grown in the right conditions, while Sheep Laurel remains low-growing (1 to 3 feet). Bog Laurel is a very small plant, barely reaching two feet, with hot pink flowers, found growing near wet areas. 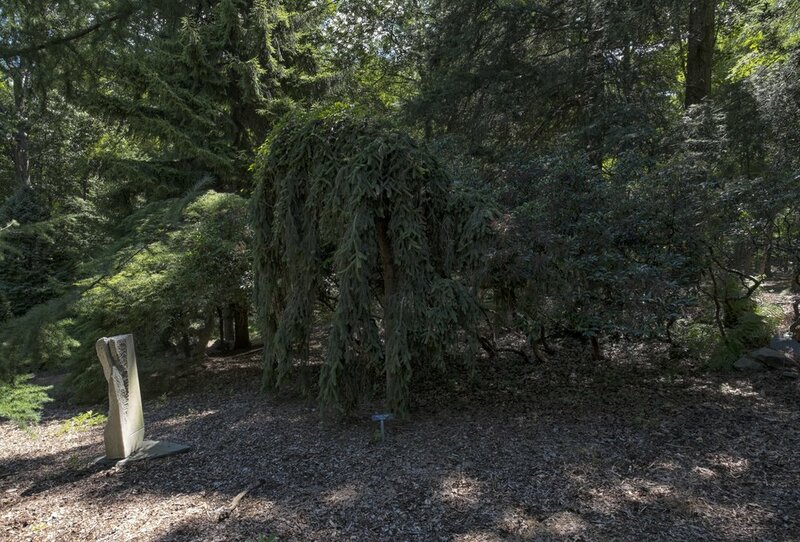 Many of the Arboretum specimens were donated by Dr. R. A. Jaynes, former plant geneticist at the Connecticut Agricultural Experiment Station in New Haven. This pathway is bordered on each side by more than 60 varieties of ferns, which thrive with other shade-loving plants. The woodlands and wetlands of the Arboretum are speckled with at least 22 varieties of native ferns. Since they were far from accessible trails, this special area was created to showcase non-natives alongside natives. As ferns are unfolding their fronds, they are known as fiddleheads. Ferns are among the oldest plant forms, dating back as far as 350 million years. Our collection includes the Tatting Fern (Athyrium filix-femina ‘Frizelliae’), the Christmas Fern (Polystichum acrostichoides), and the Upside-down Fern (Arachnoides standishii), among others. Four classic quadrants charm the visitor with aromatic, culinary, medicinal, and economically interesting herbs. The plants are annual and perennial, native and tropical, flowering in all seasons with more than 100 species in a compact setting sure to delight the senses. Herbs are products we use everyday in teas, medicines, and flavorings. The culinary section offers herbs like basil and French tarragon to flavor food. The aromatic section features fragrant herbs used in perfumes and essential oils. Applied correctly, the herbs in the medicinal section can treat indigestion, colds, and migraines. Food additives, dyes, and fibers are featured in the economic quadrant. A herbarium is a collection of plant samples and associated data that has been preserved for long-term study. These samples may include pressed and mounted plants or plant parts, seeds, dry and fluid-preserved flowers or fruits, pollen, sections of wood, and frozen plant DNA. The stored samples are referred to as herbarium specimens. In addition, herbaria (plural for herbarium) also store and manage botanical data sets, illustrations, photographs and slides, maps, and other relevant literature useful to researchers when studying the specimens. Herbarium specimens are used to study plant taxonomy, geographic distributions, and for plant identification. They also serve as a historical record of vegetation changes over time. In some cases, herbaria may contain the only specimens of plants that have become extinct or have mutated due to changes in climate and the impact of humans in their environment. Where is the Bartlett Arboretum Herbarium? The Bartlett Arboretum Herbarium is located in the lower level of the Silver Educational Center and holds specimens from as far back as 1887. The herbarium contains vascular plants and bryophytes from throughout the world with a concentration on the greater New York City area, southwestern Connecticut, Florida, Puerto Rico, Arizona and Amazonian Peru. Many of the specimens are native to Connecticut and have been collected from the arboretum grounds. In 2009, the herbarium received its Index Herbariorum acronym (BART), identifying it as a valuable resource to the research and educational community and supporting and validating the history and mission of the Bartlett Arboretum & Gardens. Please click here for a digitized list of the plant specimens found in the Bartlett Arboretum Herbarium. The Herbarium is open by appointment. Please call 203-883-4052 for information. When the Bartlett family lived on the property, this sunny walled-in garden was the site of many lively parties. In 2008, the vegetable garden was established in this site with decoratively arranged raised garden beds, pathways, ornaments, espaliered fruit trees, fruiting shrubs, and a variety of vegetables, both perennial and seasonal. The garden is completely organic with directly sown seeds as well as sets planted in the spring. Natural amendments such as egg shells, banana peels, and seaweed are used to encourage growth, and insects are deterred with companion plants such as garlic, onions, and marigolds. Many flowers are grown to attract pollinators and beneficial insects.